A-HOTEL.com - Luxury and cheap accommodation in Kalinovaya Balka, Russia. Prices and hotel, apartment booking in Kalinovaya Balka and surrounding. Guest House Aviator in Kamyshin provides accommodation with barbecue facilities, a shared lounge and a bar. All rooms feature a kitchen and a private bathroom. Situated in Kamyshin, Opava Hotel features a bar. With free WiFi, this 3-star hotel offers a 24-hour front desk. Boasting a bar, Hotel Zaprosto is set in Kamyshin. Featuring a 24-hour front desk, this property also provides guests with a restaurant. Hotel Volga features air-conditioned rooms in Kamyshin. The accommodation offers a 24-hour front desk. Apartment on 5-yy mikrorayon is situated in Kamyshin. Free WiFi is offered. Situated in Kamyshin, Guest house Usadba offers a terrace. Free WiFi is included. Located in Kamyshin, Apartment in Shestoy mikrorayon provides accommodation with a balcony and free WiFi. Guests staying at this apartment have access to a fully equipped kitchen. Situated in Kamyshin, Hotel Gloriya provides air-conditioned rooms with free WiFi. This 3-star hotel offers a 24-hour front desk. Hotel on Yubileynaya 1 features rooms in Kamyshin. At the hotel, each room includes a wardrobe. 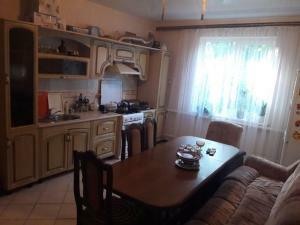 Located in Kamyshin, Apartamenty Kamyshin features accommodation with a balcony and free WiFi. Guests staying at this apartment have access to a fully equipped kitchen. Set in Kamyshin, Hotel Centra Turizma offers a shared lounge. Free WiFi and a 24-hour front desk are offered. Mini Hotel U pruda is offering accommodation in Dubovka. The accommodation offers a 24-hour front desk. Gostievoi Dom "Siemieinyi Dvorik" in Olen'ye provides accommodation with barbecue facilities, a garden and a terrace. Guests can enjoy river views. Featuring a garden and free WiFi, Guest house on Komsomolskaya 105 is situated in Dubovka. All rooms feature a kitchen and a shared bathroom. Offering free WiFi, Motel Melnitsa is located in Dubovka. Featuring a 24-hour front desk, this property also provides guests with a sun terrace. Hotel Dubrava features accommodation in Dubovka. The accommodation offers a 24-hour front desk and a shared kitchen for guests. Offering free WiFi, Mini Hotel Marina is set in Dubovka. Boasting a 24-hour front desk, this property also provides guests with a terrace.